The 1908 Messina earthquake (also known as the 1908 Messina and Reggio earthquake) occurred on 28 December in Sicily and Calabria, southern Italy with a moment magnitude of 7.1 and a maximum Mercalli intensity of XI (Extreme). The cities of Messina and Reggio Calabria were almost completely destroyed and between 75,000 and 82,000 lives were lost. According to Gianluca Valensise, a seismologist at Italy's National Institute of Geophysics and Vulcanology, the earthquake was caused by a large, low-angle SE-dipping, blind normal fault, lying mainly offshore in the Strait of Messina, between plates. Its upper projection intersects the Earth surface on the western, Sicilian side of the Strait. Italy sits along the boundary zone of the African Continental plate, and this plate is pushing against the sea floor underneath Europe at a rate of 25 millimeters (1 inch) per year. This causes vertical displacement, which in turn can cause earthquakes. The earthquake was recorded by 110 seismographic stations around the world. The Strait of Messina is part of the regional tectonic feature known as the Calabrian Arc, an area of differential uplift deriving from the dynamics of the Ionian and South Tyrrhenian tectonic units, two of the lithosphere blocks of microplates recognised in the highly fragmented Italian portion of the Africa-Eurasia contact. 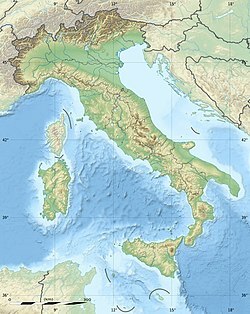 A number of the strongest earthquakes that took place in the last centuries occurred in the Calabrian Arc such as the 1783 and 1905 Calabrian earthquakes as well as the more catastrophic 1908 Messina earthquake. Records indicate that considerable seismic activity occurred in the areas around the Strait of Messina several months prior to 28 December; it increased in intensity beginning 1 November. On 10 December a 4 magnitude earthquake caused damage to a few buildings in Novara di Sicilia and Montalbano Elicona, both in the Province of Messina. A total of 293 aftershocks took place between 28 December 1908 and 11 March 1909. In 2008 it was proposed that the concurrent tsunami was not generated by the earthquake, but rather by a large undersea landslide it triggered. The probable source of the tsunami was offshore of Giardini Naxos (40 km south of Messina) on the Sicilian coast where a large submarine landslide body with a headwall scarf was revealed on a Bathymetric map of the Ionian seafloor. On Monday 28 December 1908, from about 05:20 to 05:21, an earthquake of 7.1 on the moment magnitude scale occurred. Its epicentre was in the Strait of Messina which separates the busy port city of Messina in Sicily and Reggio Calabria on the Italian mainland. Its precise epicentre has been pinpointed to the northern Ionian Sea area close to the narrowest section of the Strait, the location of Messina. It had a depth of around 9 km (5.5 miles). The earthquake almost levelled Messina. At least 91% of structures in Messina were destroyed or irreparably damaged and some 75,000 people were killed in the city and suburbs. Reggio Calabria and other locations in Calabria also suffered heavy damage, with some 25,000 people killed. Reggio's historic centre was almost completely eradicated.The number of casualties is based on the 1901 and 1911 census data. It was the most destructive earthquake ever to strike Europe. The ground shook for some 30 seconds, and the damage was widespread, with destruction felt over a 4,300 km2 (1,700 sq mi) area. In Calabria, the ground shook violently from Scilla to south of Reggio, provoking landslides inland in the Reggio area and along the sea-cliff from Scilla to Bagnara. In the Calabrian commune of Palmi on the Tyrrhenian coast, there was almost total devastation that left 600 dead. Damage was also inflicted along the eastern Sicilian coast, but outside of Messina, it was not as badly hit as Calabria. The mesoseismal area was confined near the coast along a 1–4 km wide belt that shook and destroyed Messina and surrounding villages. Catania, the largest city in eastern Sicily, did not incur notable damage. A young doctor who escaped with his life later recounted that "the profound silence was broken by an extraordinary noise like the bursting of a thousand bombs, followed by a rushing and torrential rain." Then he heard a "sinister whistling sound" which he likened to "a thousand red hot irons hissing in the water." Other survivors reported that there were three separate and different movements during the 30–40 second mainshock: the first shaking backwards and forwards, the second thrusting violently upwards, with the third moving in a circular motion. All accounts concur that it was the second upwards motion that caused the widespread destruction in Messina; the accompanying noise described as having been "exactly like that made by a fast train in a tunnel". About ten minutes after the earthquake, the sea on both sides of the Strait suddenly withdrew as a 12-meter (39-foot) tsunami swept in, and three waves struck nearby coasts. It impacted hardest along the Calabrian coast and inundated Reggio Calabria after the sea had receded 70 meters from the shore. The entire Reggio seafront was destroyed and numbers of people who had gathered there perished. Nearby Villa San Giovanni was also badly hit. Along the coast between Lazzaro and Pellaro, houses and a railway bridge were washed away. In Messina, the tsunami also caused more devastation and deaths; many of the survivors of the earthquake had fled to the relative safety of the seafront to escape their collapsing houses. The second and third tsunami waves, coming in rapid succession and higher than the first, raced over the harbour, smashed boats docked at the pier, and broke parts of the sea wall. After engulfing the port and three city blocks inland beyond the harbour, the waves swept away people, a number of ships that had been anchored in the harbour, fishing boats and ferries, and inflicted further damage on the edifices within the zone which had remained standing after the shock. The ships that were still attached to their moorings collided with one another but did not incur major damage. Afterwards Messina harbour was filled with floating wreckage and the corpses of drowned people and animals. Towns and villages along the eastern coast of Sicily were assaulted by high waves causing deaths and damage to boats and property. Two hours later the tsunami struck Malta, rushing into Marsamxett Harbour and damaging property in Msida. About 2,000 people were killed by the tsunami in Messina on the eastern coast of Sicily, and in Reggio Calabria and its coastal environs. The Messina shoreline was irrevocably altered as large sections of the coast had sunk several feet into the sea. Houses, churches, palaces and monuments, military barracks: commercial, municipal and public buildings had all collapsed entirely or were severely damaged. Many structures were cracked shells, roofless, windowless and standing upright precariously. [page needed] A boys' boarding school was pulverised, burying the students. A total of 348 railway workers were killed when the two railway stations crumbled. The American consulate was reduced to a pile of rubble: the British consulate sustained little outward damage with its flag still flying, but the interior was completely wrecked. American consul Arthur S. Cheney and his wife Laura were killed. The French consul and his children also lost their lives, although his wife escaped. Ethel Ogston, wife of the British vice-consul died instantly after being struck by a falling balcony as she attempted to escape through the streets with her husband, Alfred and daughter, both of whom survived. Former US vice-consul and Messina correspondent for the Associated Press Joseph Pierce and his family were crushed to death when their damaged home, close to the port, was brought down by the force of the waves created by the tsunami. A number of notable Italians were among the dead including politicians, the Attorney General of Messina Crescenzo Grillo, local patriots of the Italian unification and members of the nobility and literati. The Chief of Police died in his office, killed by a fallen beam. Tenor Angelo Gamba who had performed onstage in Aida the evening before the earthquake also lost his life together with his two sons when the Hotel Trinacria collapsed. The Hungarian soprano Paola Koraleck (who sang the role of Aida) was lying awake when the earthquake struck. She leapt from a window, breaking both arms in the fall. The earthquake wrecked the commercial section along Messina's Corso Vittorio Emanuele that skirted the seafront which included the elegant "palazzati". This was a long sequence of seamless 17th-century buildings that fronted the sickle-shaped harbour and most had sustained irreparable damage. The shaking was especially intense in the port area resulting in the permanent displacement of the stone pavings in a "wave-like pattern". Damage was heaviest in the old historic centre and the low, level central and northern sections of the city due to the soft sandy soil; it was less severe in the mountainous western part as the structures were built on firmer terrain such as Gonzaga Fort which was unscathed and remains to date. [not in citation given] The area between Cathedral Square and the Civic Hospital was obliterated as was the Boccetta zone. Via Porta Imperiale was also struck particularly hard. The 17th-century Real Cittadella, which guarded the harbour, was partially destroyed. Huge crevasses and fissures opened in the streets and these as well as the mounds of rubble, and falling masonry, hampered those survivors who had fled from their razed homes to seek safety. The main thoroughfares Via Garibaldi and Via Cavour were rendered impassable by the hillocks of rubble and debris that measured 5 meters (16 ft) in height. Families had become separated and a torrential downpour of rain that had begun only minutes before the earthquake added to the confusion, impeding visibility along with the darkness and thick clouds of dust. The great gas tanks at the northern end of the town blew up, entombing living survivors and the already dead. Fires broke out, caused by broken gas pipes, which added to the chaos and destruction. One such fire gutted the City Hall. The ground continued to shake with repeated aftershocks causing remaining structures to topple down onto the ruins of demolished edifices killing and injuring rescuers and those who had survived the mainshock. The civilian and military hospitals in Messina, and the civic hospital in Reggio Calabria all lay in ruins with nearly all the doctors and nurses dead. The injured in the two cities had no medical support or medicine until outside relief arrived and hospital tents were set up. Telegraph lines were severed and railway lines mangled, making communication immpossible. Most of Messina's officials were killed or gravely injured, along with almost the entire police force and soldiers of the garrison who perished when their respective barracks collapsed. Many officers in the garrison survived, their accommodation being more substantial. Prisoners who had escaped death when the prison fell began looting property and even robbing corpses of their jewellery. In Reggio an estimated 1,800 convicts died when the prison was destroyed. Peasants from nearby rural villages joined the looters. Troops were soon sent to the city and martial law was declared by General Feira Di Cossatto. Rescuers searched through the ruins for weeks, and whole families were still being pulled out alive days following the earthquake but thousands remained buried there. 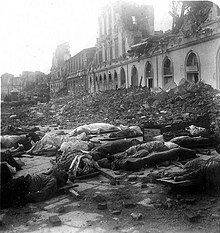 Buildings in the area had not been constructed for earthquake resistance, having been built out of small stones and carelessly-applied mortar with heavy tiled roofs, ornamental cornices, unsupported cross beams and vulnerable foundations on soft soil. Many of the edifices had four or five storeys. News of the disaster was carried to Prime Minister Giovanni Giolitti by Italian torpedo boats to Nicotera, where the telegraph lines were still working, but that was not accomplished until midnight at the end of the day. Rail lines in the area had been destroyed, often along with the railway stations. The Italian navy and army responded and began searching, treating the injured, providing food and water, and evacuating refugees (as did every ship). Giolitti imposed martial law with all looters to be shot, which extended to survivors foraging for food. King Victor Emmanuel III and Queen Elena arrived two days after the earthquake to assist the victims and survivors. The disaster made headlines worldwide and international relief efforts were launched. With the help of the Red Cross and sailors of the Russian and British fleets, search and cleanup were expedited. The Russian battleships Tsesarevich, and Slava and the cruisers Admiral Makarov, and Bogatyr, British battleship Exmouth and the cruisers Euryalus, Minerva, and Sutlej were ordered to provide assistance; the SS Afonwen was in Messina harbor during the quake (anchored in 45 fathoms (80 m) of water, but there were only 30 fathoms (55 m) when she sailed full of refugees). The French battleships Justice and Vérité, and three torpedo boat destroyers were ordered to Messina. The U.S. Navy's Great White Fleet and supply ships USS Celtic and USS Culgoa were also ordered to assist. Other nations' ships also responded. The King of Italy later awarded a commemorative medal for 1908 earthquake assistance, struck in gold, silver and bronze. Several streets in Messina have been named after the Russian sailors, including Largo dei Marinai Russi. In 2012, a monument to the Russian sailors, designed by Pietro Kufferle back in 1911, was installed in the city, and a bust of Emperor Nicholas II was opened in Taormina; subsequently, a bust of Admiral Fyodor Ushakov was set up in 2013. In the years following 1908, precautions were taken when the reconstruction of Messina began in 1909, building architecture that would be able to withstand earthquakes of variable magnitude, if one should strike again. Initially, authorities adopted a plan to demolish the remaining structures of Messina and transfer the city and its port elsewhere in Sicily but this was discarded after strong protests from the Messinesi. Among the few structures spared by the earthquake was the medieval Annunziata dei Catalani church. San Ranieri lighthouse, Forte del Santissimo Salvatore, Giovanni Montorsoli's Fountain of Neptune and the Barbera spinning mill which was later converted to a museum to house the art treasures salvaged from the ruins. The Real Cittadella, Matagrifone Castle and Monti di Pieta remained standing but sustained considerable damage. The 16th-century Church of Ringo in the fisherman's quarter of the same name along the northern Messina riviera withstood the shock and survives to date. The "Scalinata Santa Barbara" in the ancient quarter of Tirone and many of the houses known as " le mignuni" in local dialect, located in the slum of Avignone also survived relatively intact. In Reggio Calabria the Palazzo Nesci was one of the few 19th century structures to withstand the earthquake. The new city of Messina was constructed on the rubble of the old city using the plan of a modern layout of a "city regularly cut up like a checker board" with buildings of uniform size and height as presented in 1911 by architect Luigi Borzi. This necessitated the demolition of a number of edifices that were salvageable but did not conform to the new urban plan. Engineer Pietro De Nava designed a similar modern checkerboard urban layout for Reggio Calabria. In the wake of the earthquake many of the homeless residents of Messina and Calabria were relocated to various parts of Sicily and other regions of mainland Italy. 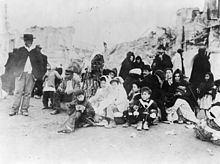 Others, including the majority of the survivors from the poverty-stricken Avignone quarter of Messina, were forced to emigrate to America. In 1909 the cargo ship Florida carried 850 such passengers away from Naples. Lost in a dense fog, the Florida collided with the Republic, a luxury passenger liner. Three people aboard the Florida were killed instantly. Within minutes, pandemonium broke out on the ship. The captain of the Florida, Angelo Ruspini, used extreme measures to regain control of the desperate passengers, including firing gunshots into the air. Eventually the survivors were rescued at sea and brought into the New York harbour where they would start a new life. The disaster affected the local economy and Messina faced a temporary depopulation after so many homeless survivors had sought refuge elsewhere; in particular Catania and Palermo where a large number found work as artisans. It has been estimated that only 19,000 remained with just 2000 in the old city centre. However, there was soon a huge influx of migrants, mostly from nearby Sicilian and Calabrian localities who were needed as necessary labourers for the reconstruction. According to the 1911 census the population of Messina had increased to 127,000. Among these were many Messinesi who had returned to their native city. Men notably outnumbered the women which resulted in a decrease in marriages. As late as the 1950s families were still living in the wooden barracks erected in the Tirone area to provide temporary housing for the homeless survivors. Because of its dearth of historical buildings due to the catastrophic 1908 earthquake, as well as the 1943 Allied bombardment during World War II, Messina has been called "the city without memory". Homeless survivors of the earthquake of Messina, in 1908, under a tent. The destroyed church of San Rocco in Palmi. ^ a b Pino, N.A. ; Piatanesi, A.; Valensise, G.; Boschi, E. (2009). "The 28 December 1908 Messina Straits Earthquake (Mw 7.1): A Great Earthquake throughout a Century of Seismology" (PDF). Seismological Research Letters. 80 (2): 243–259. doi:10.1785/gssrl.80.2.243. ^ Santini A. & Moraci N., ed. (2008). 2008 Seismic Engineering Conference: Commemorating the 1908 Messina and Reggio Calabria Earthquake (AIP Conference Proceedings). American Institute of Physics. ISBN 978-0-7354-0542-4. ^ "Sicilian culture: 1908 Messina – Reggio Earthquake & Earthquake Prone Italy". Archived from the original on 2007-06-09. Retrieved 2007-07-12. ^ a b Geophysical Research Letters, vol 33, issue 17, September 2006 "Spacial relation between the 1908 Messina Straits earthquake slip and recent earthquake distribution"
^ RMS report 2008, pp. 2-3. ^ a b c d e f RMS report 2008, p. 4. ^ Billi A, Funiciello R, Minelli L, Faccenna C, Neri G, Orecchio B, Presti D (2008). "On the cause of the 1908 Messina tsunami, southern Italy". Geophysical Research Letters. 35 (6): L06301. Bibcode:2008GeoRL..35.6301B. doi:10.1029/2008GL033251. ^ Geophysical Research Letters Vol. 35, Issue 6, March 2008. "On the cause of the 1908 Messina tsunami, southern Italy"
^ a b c RMS report 2008, p. 7. ^ a b c d Grifasi, A. "Sicily – The Messina 1908 earthquake". Retrieved 25 August 2016. ^ RMS report 2008, p. 3. ^ Mowbray 1909, p. 56. ^ Hitchens, Robert (April 1909). November 1908 to April 1909. "After the Earthquake". The Century Illustrated Monthly Magazine. New York City. New Series, vol. LV: 932. ^ Mowbray 1909, p. 34. ^ a b c d Mowbray 1909. ^ a b RMS report 2008, p. 5. ^ Mowbray 1909, pp. 39-40. ^ a b Mowbray 1909, p. 42. ^ Mowbray 1909, p. 40. ^ Cini, George (5 January 2005). "When a tsunami hit Malta in 1908". Times of Malta. Archived from the original on 24 October 2015. ^ Mowbray 1909, pp. 38, 62, 67, 111. ^ Mowbray 1909, pp. 59, 116. ^ Mowbray 1909, pp. 67, 112. ^ Mowbray 1909, p. 68. ^ Mowbray 1909, p. 38. ^ a b Mowbray 1909, p. 46. ^ Mowbray 1909, p. 66. ^ Mowbray 1909, p. 113. ^ a b RMS report 2008. ^ a b c Mowbray 1909, p. 36. ^ Mowbray 1909, p. 71. ^ Mowbray 1909, p. 55. ^ Mowbray 1909, p. 12. ^ Mowbray 1909, pp. 52-53. ^ Mowbray 1909, p. 80. ^ Mowbray 1909, p. 39, 60, 70, 88. ^ Mowbray 1909, pp. 41, 98. ^ Mowbray 1909, pp. 39, 60, 70,. ^ Mowbray 1909, p. 39. ^ Mowbray 1909, pp. 48, 62-63. ^ Mowbray 1909, p. 78. ^ Tarr, Ralph Stockman; Martin, Lawrence (1914). College Physiography. New York, New York: The Macmillan Company. p. 413. ^ "Fritz Peters' first medal was for rescue work following Messina disaster". 2011-12-15. ^ "Awards granted for service after the Messina Earthquake 1908". Retrieved 25 August 2016. ^ "Messina: Intitolazione largo dei Marinai Russi". CM News. Retrieved 21 February 2019. ^ "L'intervento dei marinai russi dopo il terremoto 1908". Tempostretto. Retrieved 21 February 2019. ^ "Montato il busto dell'ammiraglio Ushakov. Sarà scoperto il 24 aprile". Tempostretto. Retrieved 21 February 2019. ^ Mowbray 1909, p. 114. ^ a b Messina Kalos Luoghi di Sicilia. Supplement n.3 May–June 1997 edition. Published by Edizioni Ariete, Palermo. ^ RMS report 2008, p. 11. Mowbray, Jay Henry (1909). Italy's Great Horror or Earthquake and Tidal Wave. Washington, D. C: G. W. Bertron, Office of the Librarian of Congress. "The 1908 Messina Earthquake: 100-Year Retrospective" (PDF). Risk Management Solutions. 2008. Retrieved 27 April 2018. 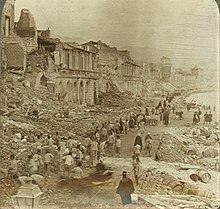 Wikimedia Commons has media related to 1908 Messina earthquake. Belknap, Reginald Rowan (1910). American House Building in Messina and Reggio: An Account of the American Naval and Red Cross Combined Expedition, to Provide Shelter for the Survivors of the Great Earthquake of December 28, 1908. New York, New York: G. P. Putnam's Sons. Retrieved 11 July 2011. Hichens, Robert (April 1909). "After The Earthquake". The Century Illustrated Monthly Magazine. 77 (6): 928–939. Retrieved 11 July 2011. Hobbs, W. H. (1909). "The Messina Earthquake". Bulletin of the American Geographical Society of New York. 41 (7): 409–422. doi:10.2307/199619. JSTOR 199619. Retrieved 11 July 2011. Perret, Frank A. (April 1909). "The Messina Earthquake". The Century Illustrated Monthly Magazine. 77 (6): 921–927. Retrieved 11 July 2011. Perret, Frank A. (1909). "Preliminary Report On The Messina Earthquake Of December 28, 1908". The American Journal of Science. XXVII (Fourth Series): 321–334. Bibcode:1909AmJS...27..321P. doi:10.2475/ajs.s4-27.160.321. Retrieved 11 July 2011. "The Italian Earthquake". Scientific American Supplement (1726): 71–74. 30 January 1909. Retrieved July 11, 2011.